Once a month Art Jewelry Elements (AJE) hosts a component giveaway and jewelry reveal. March’s component was made by the talented Caroline Dewison of Blueberribeads. Members of the Art Jewelry Elements team, plus a lucky guest artist were given one of these beautiful luna moth pendants that Caroline made for us. I chose the lilac moth in the top row. I had recently ordered several colors of matte “peanut” beads, (aka farfalle beads) and I was anxious to put them to use. I made a mix of lilac, dark purple and cream-colored peanut beads. Then I tossed in some metallic purple, lilac and sage green seed beads. I created 3 strands on each side using this mix of beads and I wove them in and out of larger beads. I dangled flowers at the points where the beaded cords attached to the chain. Two flowers dangle on one side and one flower dangles on the other. The Luna Moth Necklace is now available in my Etsy shop. 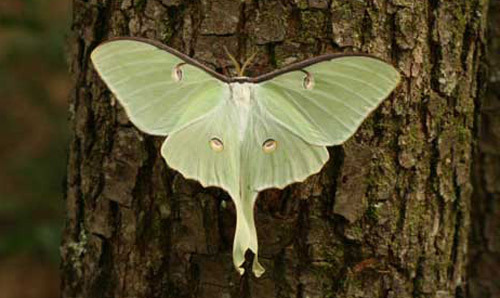 I thought you might also enjoy seeing what an actual Luna Moth looks like. Want to see more gorgeous jewelry with Caroline’s Luna Moth pendants? Here are all the links. Have fun! 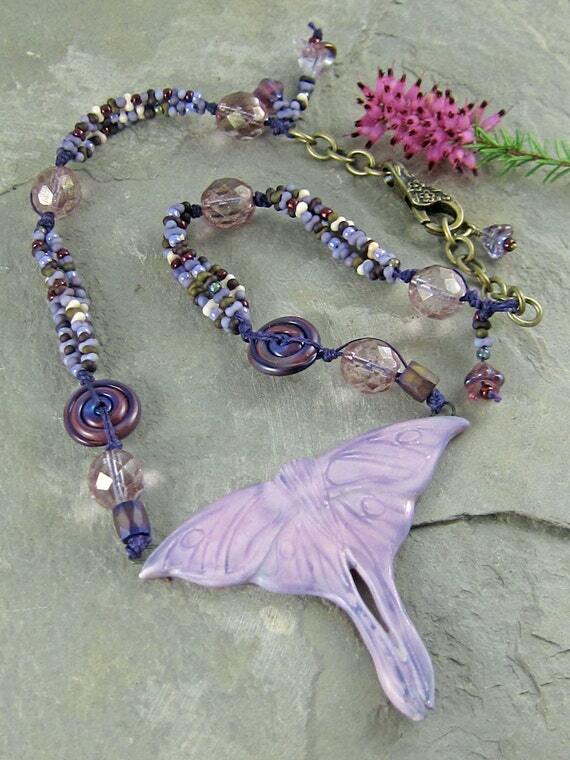 This entry was posted in Bead And Jewelry Challenges and tagged Art Beads, Art Jewelry Elements, artisan jewelry, bead blogs, blog hop, Blueberribeads, Caroline Dewison, ceramic, fashion, handmade jewelry, Linda Landig Jewelry, necklace by Linda Landig. Bookmark the permalink. 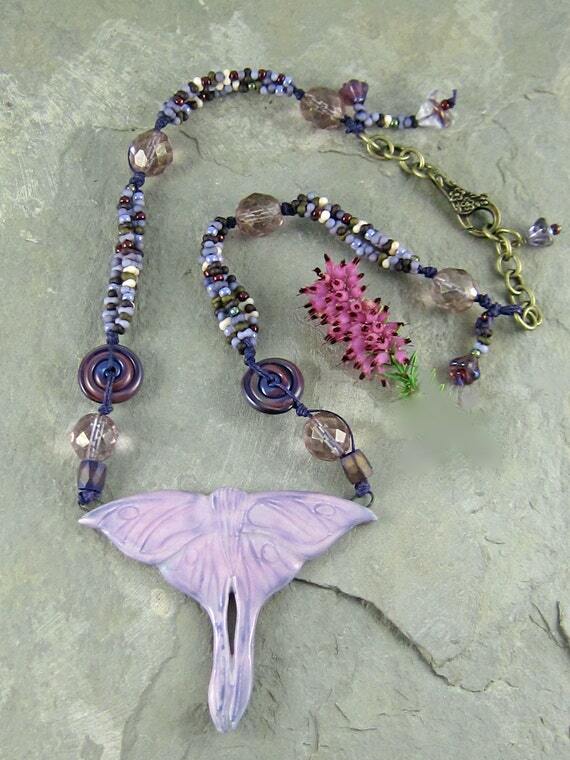 I love the luna moth components and your necklace is just beautiful! It really captured the magical moonlight quality of the luna moth. Very pretty Necklace Linda – beautiful colour combinations…. Stunning design Linda! Those little peanut beads are gorgeous, you have a great eye for colour, the whole combination is just gorgeous! Thank you for joining in the challenge! Oh, my it is a gorgeous necklace. I love the colors and design. Beautiful necklace Ms. Linda! I love the soft look. I can see your Luna moth flitting around in the garden of your work. Linda, I love those luna moth pendants! I have a weakness for moths anyhow, like them way better than butterflies. I find their muted colors soothing and their night time habits resonate to my slightly vampire nature. You did a beautiful job with this pendant. made me want one of my own. So beautiful, Linda, as is everything you create! I really like what you did with the peanut beads, too. I love the translucent grape-hued glass with the opaque lilac glaze. The purple cording is beautiful with it, and the peanut beads add nice texture to the smooth focal. Such a luxurious color palette! I love the purples with the brass. Gorgeous necklace, love the colors and your double rows of peanut beads. So lovely, Linda! Love the colors and the different textures! Wow – that palette is gorgeous. And I love how you’ve woven the beaded strands through the larger beads. Yum!! I like those peanut beads! Great transitions too. What a great necklace! I love the colors and the peanut beads are perfect! Stunning! The mix of peanut beads add a dainty air to the necklace and beautifully combine with the boldness of Caroline’s moth. And your color palette echos the dim colors of a garden lit by a full moon—so lovely!